The Manoman's insight on the Yankees, Rays, and all of baseball can be found if you would just scroll down the page, and yes, Evan Longoria is really his twin brother. Seriously. ← Extra! Extra! My Blog Was On the MLB.com Homepage! When you think of the number six, what do you think about? You probably will think about death, unluckiness, or the devil right? Well, right now when I think of the number six I think of the latest leaders, happiness, and the Yankees sixth captain, the late, beloved, Thurman Munson. Since I placed six in the latest leaders I would like to dedicated my ranking to the great Thurman Munson. Thurman Munson was born on June 7th, 1947 in Akron, Ohio to Darryl Munson and Ruth Smylie. He was a standout in baseball as well as basketball and football. After he graduated from Lehman High School in Canton, he opted to attend Kent State University where he was a teammate of pitcher and broadcaster Steve Stone. In 1970, Mr.Munson was named the AL Rookie of the Year after hitting .302 with 7 homeruns and 53 R.B.I.’s. Six years later Thurman won the A.L. MVP award, fitting .302 with 17 homeruns and 105 RBI’s. That year Munson also swiped 14 bases and to this day, is the only Yankee ever to win the AL MVP and the AL Rookie of the Year. Thurman Munson won 3 straight gold gloves from 1973 to 1975 and helped lead the Yankees to 3 consecutive World Series starting in 1976. He ended up being a 7 time All- Star over his 10 year career and he hit 113 homeruns, drove in 701 runners, and hit to the clip of a .292 batting average. He became the first captain since Lou Gehrig during his career, and he was the 6th Yankee captain ever. 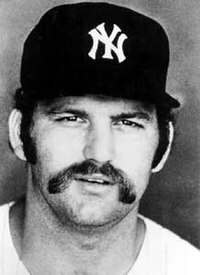 Thurman Munson “retired” in 1979, when his plane crashed during practice takeoffs and he died of asphyxlation rather than injuries sustained by impacts or burns. Immediately after Munson’s death, George Steinbrenner announced that Munson’s number was being retired and on September 20th of 1980 a plaque in Monument Park was dedicated to him. Posted on February 6, 2009, in Dailies, MLB and tagged AL Gold Glove Award, AL MVP, AL Rookie of the Year, George Steinbrenner, Lou Gehrig, Monument Park, Steve Stone, Thurman Munson, World Series, Yankee Captain, Yankees. Bookmark the permalink. 11 Comments. Hey, manoman12 … “Welcome” to MLBlogs !!! Thanks and I wanted to pick Thurman to dedicate this post to because he is a true Yankee legend and he was the 6th Yankee captain. It is very saddening that he died when he was doing practice takeoffs in his brand new plane. Great blog Manoman and a great player to dedicate you #6 to. The Yankees had had more then their share of lives cut short. 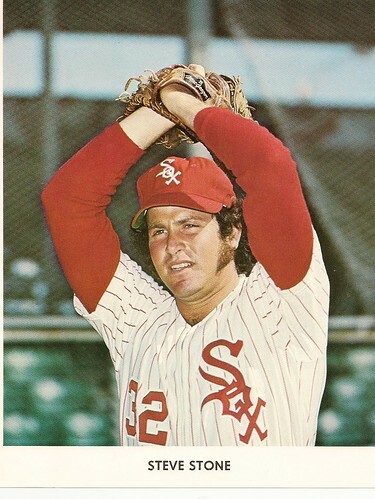 I talked about Lou Gehrig and Catfish Hunter on my blog today. Thanks for reading my blog. I do not get many comments. Congrats on being #6 although I think it as just as much to do with being a Yankees fan than the great content. After all, Yankees and the hated RS Nation people overpopulate this site. How can I with my little Midwestern point of view ever compete? Beautiful pick for your dedication blog. Just the thought that Munson tried to save his passengers after the crash told me all I really needed to ever know about him as a man. You always wonder what someone might of ended up if they had lived. I have wondered what magic he would have done behind the plate during the rest of his time as a Yankee. But I have also wondered the same about my friend Cory Lidle before his own plane disaster. It is rare that a plane has a accident, but if you are a Yankee, seems like Not piloting a plane might be written into your contract now. Both men were guys of honor and principle, and are missed as much for their love for the game, as they are for being great men. Thanks for your comments on my blog! Even though I have a strong dislike for the Yankees, it’s extremely interesting for me to see the different perspective of the situation. I can’t stand A-Rod, but it’s pretty helpful seeing it from the other side. And that’s awesome that you caught a foul ball during batting practice! I’ve always wanted to catch a foul ball, though I have been thrown warm-up balls by the bullpen catcher at Fenway on some occasions. I would love to be in this mock draft. If you would like to tell me the information you could just let me know. Thanks for the Comment to! On the mock draft comment you had, I would like to, but I do not know how. Please tell me how a mock draft works. If you tell me your email adress, I’ll tell you mine. Mine is cbrantner@nelson-tel.net I want to enter, but please tell me more. I am still working out the details so stay tuned. I prefer not to share my personal information so I’ll just leave a comment on your blog about a mock drft. 2r2dVery nice work. I am looking forward to reading more of your posts. strictlycubsbaseballI think Reyes ends up in Miami. Keep Gabby at 1B is an easy decision if I'm GM for the Marlins too.